Online shopping is a godsend for university students who can’t or won’t leave their campus to buy things they need. 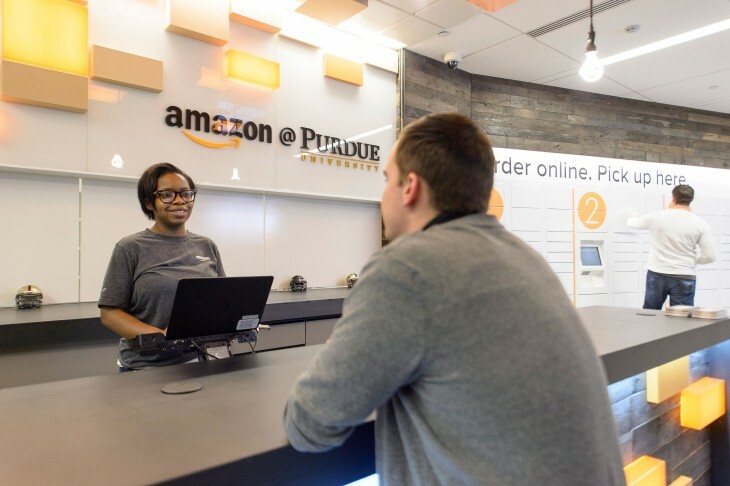 If you’re a student, alumni or faculty at Purdue University, however, Amazon just made online shopping even more convenient for you. The company today announced the opening of its first-ever staffed customer pick up and drop-off location at the University. The location will allow students to easily receive and return school items and other orders. Purdue members even get free one day pickup. There are some special university-only featues as well. Once Purdue students activate their Amazon Student account, they will be able to identify the books they need for class by looking for items with Purdue’s logo and class information. After an order arrives, they’ll receive a notification and will be able to either scan a bar-code to pick the item up from a locker, or ask one of the store staff to help them. Purdue students aren’t the only ones to getting the retail hub – Amazon intends to move into the University of California, Davis and the University of Massachusetts, Amherst next. Starting a staffed retail experience at universities make sense given college students’ propensity for buying and returning items – textbooks in particular. Still, we wouldn’t be surprised to see the company open up staffed locations for the general populace in the future. After all, it’s already initiated work on moving into the physical shopping experience, including an upcoming flagship store in New York City.